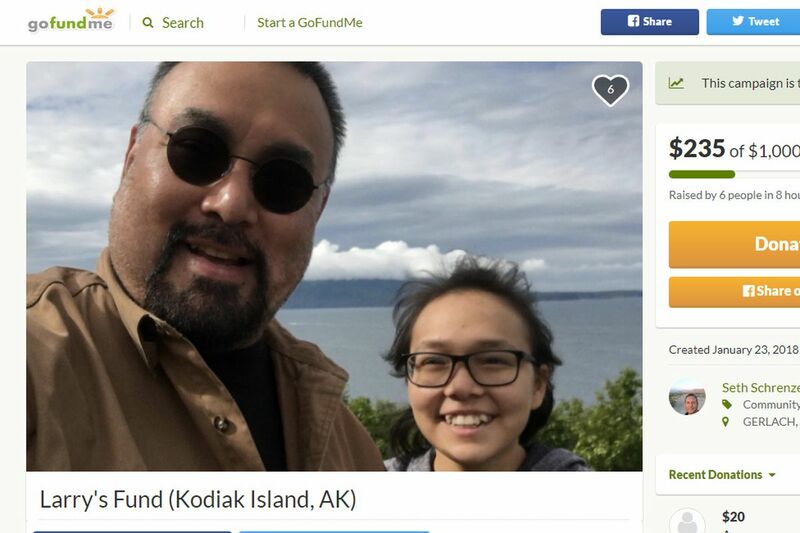 Seth Schrenzel created a GoFundMe campaign for Larry Pestrikoff of Ouzinkie, Alaska. Larry livestreamed the events following the tsunami warning after the magnitude 7.9 earthquake southeast of Kodiak early Tuesday morning. Shortly before 1 a.m. Tuesday, Larry Pestrikoff pointed his cellphone out of his window toward the harbor in the tiny Alaska village of Ouzinkie, near Kodiak, and hit, "Start Live Video." He started broadcasting live on Facebook. For nearly two hours, the 48-year-old janitor kept the camera rolling, waiting to see if the tsunami that emergency officials warned about would arrive. The wave never came. But the internet fell in love with Larry — the soft, steady, monotone narrator of the middle-of-the-night tsunami scare that sent hundreds of Alaskans evacuating for higher ground. It also sent thousands of people, hungry for information, to Larry's online broadcast, which was viewed 141,000 times by Tuesday evening. "I didn't expect anything like this at all," he said over the phone. "I've gone live before like at the air show or something up in Anchorage and I think only two or three people might have watched." By Tuesday evening, Larry had more than 300 new Facebook friends. A stranger from Nevada had started an online fundraising page to help pay his bills. Someone else created a meme that said in all caps: "I watched nothing happen with Larry 1/23/2018." Larry never expected any of that. It's sort of odd and makes him laugh. He said he was watching a show on Netflix just after 12:30 a.m. Tuesday when he felt the magnitude 7.9 quake. It "felt more like a jiggle," he said. The tsunami warning sirens blared in the village of about 150 people. An emergency alert said a tsunami wave could hit Kodiak in about 90 minutes, close to the remote village of Ouzinkie where Larry waited with his cat, named "The Bird." Larry started broadcasting. He said he thought maybe some friends would watch. Most of the time, his video showed just darkness outside his window and a few blurs of light from the harbor. That is, unless he held his night-vision goggles up to his phone's lens. He talked about the water levels and a menagerie of topics, from his credit card bills to gas prices to his dying tomato plant. He looked at the tide tables. He talked about his daughter. He took phone calls. Sometimes he just let the radio play. "This video is of me sitting and waiting for a tsunami to roll in," Larry said at one point. More than 3,000 people from across the globe were listening. "It's been over an hour and the water hasn't moved." Larry said he never intended to broadcast on Facebook during his entire wait, but as people became interested and started asking him questions he felt like he couldn't just stop. At one point during the broadcast his phone was dying, he said, "and people kept saying, 'Plug your phone in, Larry! Plug your phone in!' "
He remembers people chiming in from Australia, Europe and Japan. News organizations asked to use his footage. He said he would give the video to FOX News. "Maybe Donald Trump's watching?" he ponders in the video. "Hello, Mr. President." Does he feel a little famous? No, he punctuates with a laugh. Facebook users told him he had a good voice for radio. "They said it was soothing," he said. "I'm like, 'OK, glad it helped.' "
All in all, he said, he's glad he made people feel better.